We need to tell the stories of local reparation and change, instead of so often focussing on the damage done. 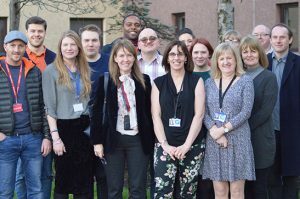 On Tuesday we headed for Falkirk, where we were welcomed by Lynda Ross-Hale, Senior Manager for the Cyrenians. 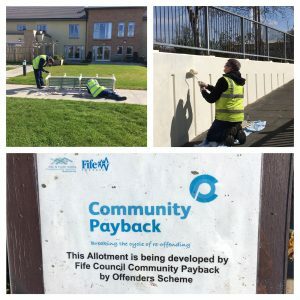 The Cyrenians have a long history of supporting those engaged in Community Payback Orders in Falkirk, believing in people and building on their strengths. 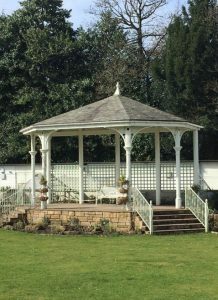 One particular project, the regeneration of the Walled Garden in Dollar Park has returned a forgotten treasure to the local community. 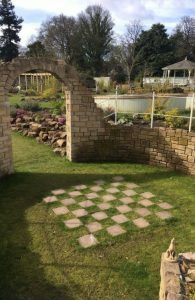 The garden is now completely maintained by those completing unpaid work, some of whom have remained involved in the upkeep of the space and encouraged to develop water features and growing spaces. We met the local Provost taking a walk in the garden, who was incredibly emotional about the beautiful green space created, and it was clear a lot of fond memories had been restored for him and his community. 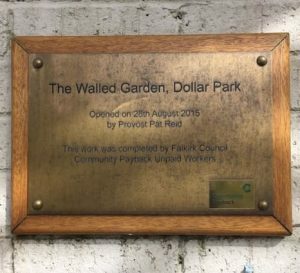 While the residents of Falkirk have visibly benefited from the Walled Garden in Dollar Park, the project taught us the value of allowing people to continue to engage if they still have more to give, often beyond the length of their Community Payback Order. Linda and her team really understood this and provided access to sustainable opportunities for everyone, whatever that might look like. Finally a return to Fife on Thursday. 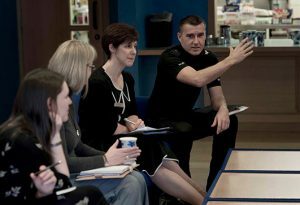 I was met at Kirkcaldy Town House by Bill Kinnear, Service Manager for Criminal Justice Social Work. Bill kindly plied me with caffeine before I went out to visit Unpaid Work projects being completed across Kirkcaldy and Glenrothes. These included planting a sensory garden for care home residents, restoring an underpass to improve resident safety and maintaining an allotment that provided soup packs to local Food Banks. I was particularly struck by the support unpaid work gave to the Kirkcaldy Food Bank, completing all deliveries to distribution centres every three days. Without this support the service couldn’t operate, at time when demand is greatly increasing. Unpaid Work in Fife is keen to develop in new and creative ways to benefit those completing orders and local communities. 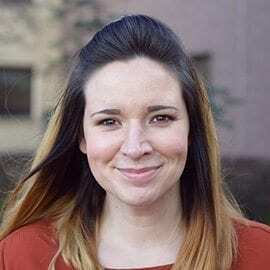 Ideas include ‘up-cycling’ furniture for people without the funds to buy and identifying training for Unpaid Work Supervisors to support clients with their welfare needs, including education and employment. Management were really listening, and I got the impression there was no such thing as a ‘silly question’ from anyone involved. I don’t think I understood how much unpaid work benefited the communities most blighted by crime, but it does. We need to tell the stories of local reparation and change, instead of so often focussing on the damage done. The Unpaid Work service also supports a lot of organisations to achieve things they otherwise couldn’t, and it should be possible for them to donate their own skills and time to those completing orders for the purposes of their rehabilitation. What a week! I am a suitably changed woman, as always, by everyone we met and a huge thanks to everyone who gave their time. There is obviously a lot more to see, but so far my experience has only reinforced how privileged I feel to learn from people so passionate about change for those experiencing community justice and within the communities more affected.